This is just terrible. Vanessa Williams' Yorkie was stolen. May 31, 2007 -- It could be nefarious dognapper, or just a hungry coyote. Either way, Westchester authorities have a mystery on their hands as dogs belonging to the rich and famous-including singer/actress Vanessa Williams-have vanished. 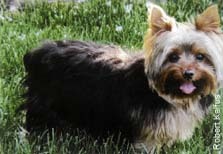 For those of you who don't know, I have a Yorkie named Beverly. Click here to read a post about her vajayjay.